Dutch poetess; born at The Hague July 14, 1837; died at Arnhem Nov. 4, 1881; granddaughter of Chief Rabbi H. J. Hertzveld of Zwolle. 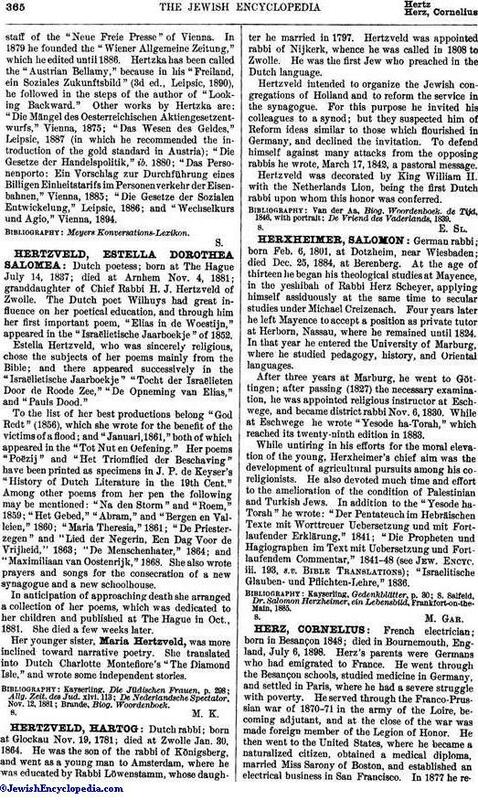 The Dutch poet Wilhuys had great influence on her poetical education, and through him her first important poem, "Elias in de Woestijn," appeared in the "Israëlietische Jaarboekje" of 1852. Estella Hertzveld, who was sincerely religious, chose the subjects of her poems mainly from the Bible; and there appeared successively in the "Israëlietische Jaarboekje" "Tocht der Israëlieten Door de Roode Zee," "De Opneming van Elias," and "Pauls Dood." To the list of her best productions belong "God Redt" (1856), which she wrote for the benefit of the victims of a flood; and "Januari, 1861," both of which appeared in the "Tot Nut en Oefening." Her poems "Poëzij" and "Het Triomflied der Beschaving" have been printed as specimens in J. P. de Keyser's "History of Dutch Literature in the 19th Cent." Among other poems from her pen the following may be mentioned: "Na den Storm" and "Roem," 1859; "Het Gebed," "Abram," and "Bergen en Valleien," 1860; "Maria Theresia," 1861; "De Priesterzegen" and "Lied der Negerin, Een Dag Voor de Vrijheid," 1863; "De Menschenhater," 1864; and "Maximiliaan van Oostenrijk," 1868. She also wrote prayers and songs for the consecration of a new synagogue and a new schoolhouse. In anticipation of approaching death she arranged a collection of her poems, which was dedicated to her children and published at The Hague in Oct., 1881. She died a few weeks later. Her younger sister, Maria Hertzveld, was more inclined toward narrative poetry. She translated into Dutch Charlotte Montefiore's "The Diamond Isle," and wrote some independent stories.